PLEASE NOTE: I began playing with this 24 color palette in early 2015, and have made numerous small changes to the color selection. Both from my own test paintings and feedback from other professional artists. I don’t think color I’ll ever stop testing colors – I already know I want to switch out Fuschite for a warmer yellow green like Rich Green Gold (out of stock in my local shop today). I’ve edited this post as I make changes – and I’ll keep doing so as I move colors in the set. So you can check back here for the ‘final’ (current) word on my color choices. I still recommend a traditional split-primary palette to beginners – listed over here on the watercolor materials page. The split-primary was how I learned to mix color and I think it’s easier to understand at first. I call this 24 color selection a Full Spectrum Palette. It has a warm and cool side, with Blues, Blue/Greens, Greens and ‘Blacks’ on one side, and Yellows, Earth Tones, Reds and Violets down the other. I’ve arranged the colors in a kind of light/mid/dark philosophy in their rows – (such as the violet row) – sometimes it’s more of a warm-to-cool gradient – such as the Blue/Green row. This is a 5×8″ (when open) paintbox as compared to 14 in my previous 3×5″ bijoux box. I like the larger mixing area offered by that flip out panel below. I like to pack small, but upsizing to this kit was worth it for the mixing area alone. Let me know if you’d make any replacements to this mix. I’m always curious what other people are using for pigments! FURTHER NOTE: I can also say, now that I have tested artist grade tube colors and equally high-quality pan colors side by side – there is a noticeable difference in how they re-wet. 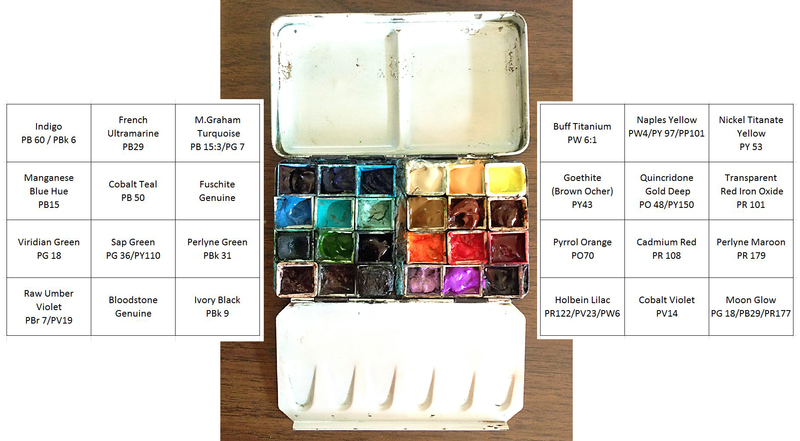 In a typical usage case artist grade pan colors release more pigment faster than most of my tube pigments – IF that is – the tube color has begun to dry out in the tin. This is typical after two or three days in northern climates. If the paint is fresh from the tube, there is no difference to re-wetting – and in fact, tube colors allow me to pick up juicy gobs of color and let them mix and bloom on the wet paper. This means, if you don’t paint that often, pans might be the better choice. (The re-wetting is very convenient). However, if you like to paint very wet, or with a lot of blooming color – then tubes will win out – but you have to keep your paint fresh. THanks for sharing your palette colors! I want to try that Holbein Lilac! I would recommend Hansa Yellow Medium (Daniel Smith), my favorite yellow. I like that lilac as it’s quite opaque. A bit like a lavender cerulean. Give it a try! Hansa yellow would probably make great spring greens I bet. When and where will you be in Ohio? Yes, the lilac looks yummy. Where do I find a rig like this, looks much more compact than the standard expanded palette? I have exactly the same box with the removable tray with twelve half-pans. There is a Lucas trademark on the black painted case. I guess I could convert it easily enough to hold 24 half-pans. Whoa! That’s a lot of green! Do you mix any greens? 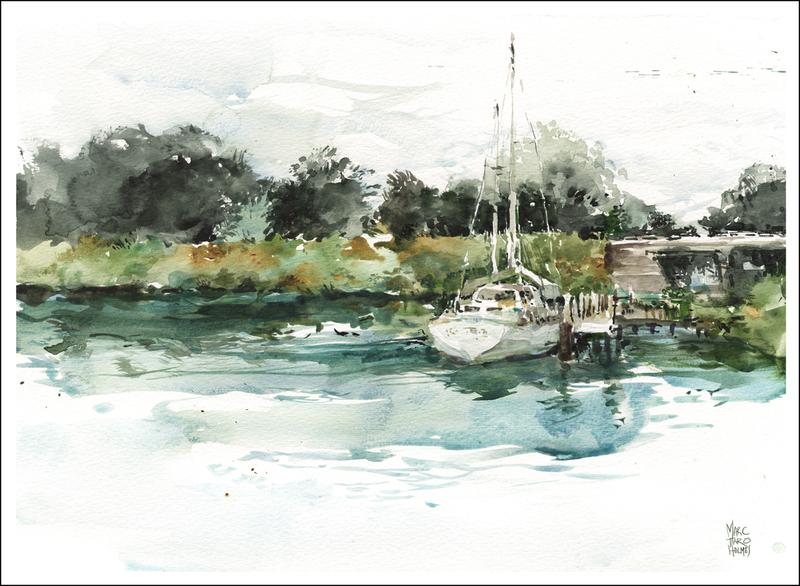 I find I use them all in foliage – I paint fairly quickly on location, so ‘convenience’ mixes do save time :) I suppose to be honest I hardly use viridian. That’s another one that might be on probation. But sometimes there is a dark but sharp green in tropical foliage or deep water? But for normal northern foliage I usually start with a sap or perlyne then charge into it with a yellow or red for variation. The Terre Verte is new to me, I’m just testing it. And the fuchsite is really just for Montreal’s copper domed churches, but then I found it handy for the ocean and tropical plants. Here’s one that uses all the greens! I’m from central Ohio. When will you be in Ohio and where in Ohio? Kremer makes those empty boxes and they are available at Amazon for excellent prices..$17 for that small one. They have two more larger boxes also that are nice for those of us who find 24 paints a tad on the low side. Shadow Violet is my current favorite violet…perfect for…shadows. Black Tourmaline is a wonderous granulating grey to black too. I want to try that DS Luna black sometime, which is supposed to be super duper granulating. That might be a neat thing. When I remove all these greens that everyone is on my case about, I can have some space for that! Hehe. Thanks for sharing, Marc! I found some good old friends =) Moonglow has certainly been my favorite for the last year or so. I noticed that I can perfectly go without viridian although it´s still in my box. French Ultramarine and quin gold (I use the normal, not the deep) make for quick mixes and wonderful greens. More livelier greens I get easily mixing quit gold with prussian blue that I otherwise only (and rarely) use for some spectacular water scenes … Quin gold is so versatile I won´t miss it! I also substituted burnt siena with quin burnt orange half a year ago and I still like it very much. You might try Verditer blue as a nice alternative to Cerulean…. I’ll check that out. Also maybe your Manganese blue also. Yes, I use that blue as well, it mixes well with most of the yellows to make various greens. Cadmium red and yellow. Lemon yellow. I mix all my greens from Windsor blue (green shade) with various yellows. I love my Perylene Green and I have a comparable purple to your Winsor Violet, mine’s DS Carbazole V. Together they make an incredible black. Give it a go and see how you like it! I tried this and was amazed at the deep black I got – thanks so much! I just learned this a few weeks ago… I’m so glad you like it! My travel kit is made up of fewer paints….Quinacradone Gold, Burnt Sienna, Alizarin Crimson, Scarlet Lake, Cadmium Red Light, Lemon Yellow, New Gamboge, Raw Sienna, Raw Umber, Burnt Umber, Ultramarine Blue, Cobalt Blue, Manganese Blue and Dioxine Purple. I am going to southern Utah in a few weeks so this palette is for that trip. You probably notice that I don’t have any greens. I mix my own but will sometimes take a tube of Sap green. Most of my paints are W/N. Mary, I’ve used Thalo Blue in the past but because of it’s staining nature it is almost impossible to lift. Prussian Blue (Antwerp Blue) works just as well as Thalo Blue for making green. Does not stain as much. I love your colours Marc but have a question. Did you paint sand at all? I am in Bermuda and can’t get the colour of the sand right. I have lemon yellow, cadmium yellow and orange, Quinn gold, burnt sienna, Crimson Aliz, cad red, ultramarine and turquoise. I loved your water painting. Thanks for the comment. I will look at my colour balance when I get home! For now I will try my lemon yellow and the burnt sienna. Tomorrow is another beach sketching day!! I’ve looked a little closer at your 24 pigments but I have always thought that Burnt Sienna was closer to red than a yellow. On my larger watercolor palette I put it with the red’s because when Burnt Sieena is mixed with say a Hookers green you get a nice dark that can almost be black. This happens when you mix most red’s and green compliments. I don’t own or have any black on any palette (except in my Lamy fountain pen). I see your reasoning Marc…. Using pigments as being cool vs warm can be difficult to comprehend at times. Natural light is made up of all colors yet those same colors as pigments make black. The red’s, orange’s and yellow’s in artist lingo are called warm whereas those same colors mixed with blue are called cool. I have not used Bloodstone or Moon-glow yet but will consider them in my next purchases. Wow. 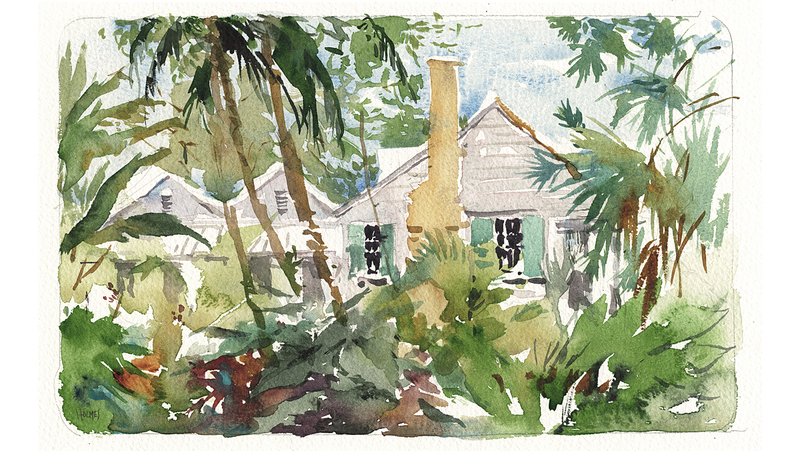 This was a super fun post w/ great comments for a watercolor experimenter. I want to go out and buy a bunch of colors. I was advised by my instructor to keep it simple and work on mixes for a while, but I’ve noted some of the colors I’d like to try! Thanks! I’m so excited that you’re coming to Richmond! Unfortunately I’ll be out of town that weekend, but I look forward to seeing some of your sketches. It’s a lovely city! I am so glad you posted this box of 24…it makes my box of 44 just right–now I have to stop looking at others palettes as I have no more room in my tin. I am not 100% sure how to post a photo here…but let me try this. You may have been ribbed for all your greens…I can take it for all my earths and all my blues…All DS except for “G” for Graham. Marc, how do you use your Pyrrol orange? I’ve stopped carrying it because I only used it unmixed – the paint on an old Piper airplane, for example. Where do you use it in mixes? I’m mainly using it in fleshtone and brick buildings – barring something like a jacket or sign. Thanks for hosting a great discussion here Marc. This palette is quite different from the one you list in watercolor gear here, and also on your fantastic Craftsy class. 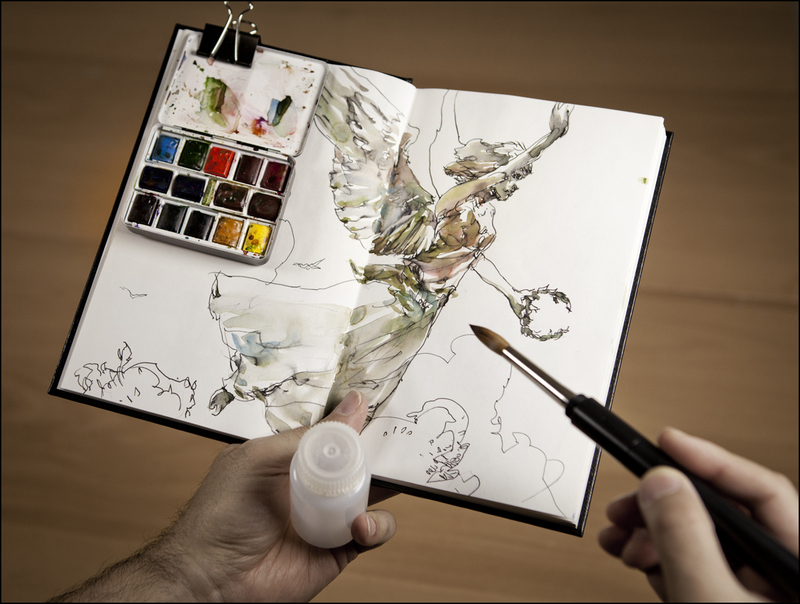 Are you finding yourself using this palette for people sketching also? I do yes – I haven’t had a chance to try it life drawing. But I did use it for St. Patrick’s. I think I’ll try a different setup for Italy, just for fun – but this is intended to be my “everyday carry”. Interesting palette, Marc. For Italy, I recommend Naples Yellow. Not only is the name right, but it’s milky color worked well for me there and in Provence. Last year I purchased the Schminke metal palette as recommended by James Gurney and like it a lot. Looks similar to yours, just larger. I got a free tube of M Graham Turquoise that is lovely but cannot go in my travel palette since moving to the UK that brand seems to fall into the never dry and makes a giant mess in my palette category! Thankfully I paint a fair amount at home and have a palette that I use there and tend not to tip over too much! It had been my second favorite brand of paint following Daniel Smith. I’ve heard a lot of people saying M Graham colors give them trouble – running in the palette. I do is two things to help here: fill colors at night before I go to bed and leave the palette open to the air overnight. That helps colors ‘skin over’. And then, place the palette in the bottom of my gear bag laying flat, and keep everything else on top – essentially keeping it as horizontal as possible to the ground as I walk around. Doesn’t stop all color running all the time, but works well enough.